It’s amazing how much trouble you can get into with just 140 characters. 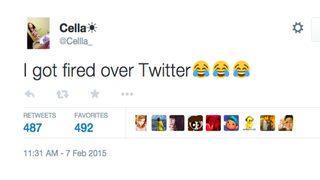 Just ask the Texas teen who goes by the Twitter handle @Cellla. Her new boss saw the tweet and fired her before she even started. “Good luck with your no money, no job life,” he responded in a tweet. Just as social media sites like Twitter, Facebook and Instagram are being used to keep friends and family connected, potential (and current) employers are using these same tools to screen and connect with potential job candidates. * Candidate lied about qualifications (25 percent). There’s no shortage of people who’ve had a social media blunder that resulted in a job disaster. Remember Justine Sacco, the public relations executive who sent an insensitive tweet about AIDS in Africa before boarding an 11-hour flight to South Africa and ended up becoming a worldwide trending topic that led to her being fired? Don’t share photos of excessive drinking, drug use or drug paraphernalia on social media. Unless you are Rihanna or Snoop Dogg—who are multimillionaires—chances are you won’t get away with posting pictures of yourself using drugs and drinking. Many employers require drug testing to avoid hiring someone who might become a problem employee. Don’t use excessive profanity or inappropriate language. We’re all adults and we’ve all used a curse word or two in our lives. Is it a crime? No. But be aware of how often you’re using profanity online. Is your workplace conservative? If so, an employer probably won’t feel comfortable with the number of f-bombs you just dropped during a Twitter rant, especially if you have your employer’s information in your social media bio. Don’t bad-mouth your current or potential employer. While you may see your social platform as a way to let off steam, it is absolutely not the right venue to do so. Before you unload on social media, talk to a trusted friend or family member. Or write it in a journal. Better yet, you should go to your co-worker or employer directly if you are having issues at work. What you shouldn’t do is go public for your employer—or prospective boss—to see. Why would a company hire a person when it knows there may come a time when he or she might turn around and bad-mouth it on the Internet? Don’t make discriminatory comments about race, gender, religion, etc. If there’s even the slightest chance your post might be offensive, just don’t post it. Discussions about race, gender, religion and even politics are hard enough, but they can be particularly dicey in the limited-character world of social media. It’s best to have those conversations in private. And jokes based on race, gender or religion? Don’t do it. Don’t post provocative or sexual photographs of yourself or others. You are not Kim Kardashian. Keep your private photos private, plain and simple. This should go without explanation, but you’d be surprised how many people mention their unmentionables. Do some digital cleaning of your social media profiles. Anyone can see your profile pictures, cover photos, “liked” pages and groups, so be sure to keep those appropriate and up-to-date. Make sure you do a quick Google search of your name to see what comes up and what you should change. Do use social media to network. The same way you can lose a job because of social media, you can also gain one. Your profiles should be an extension of your résumé. Be sure to keep your LinkedIn account up-to-date and continue to connect with colleagues, professors, classmates and recruiters that you meet. Put your current job title in your Twitter bio. You never know who might come across your profile and spark up a conversation. Do use social media as a resource. LinkedIn is one of the best platforms to learn about companies you are interested in; companies regularly post updates about job openings, as well as current projects or ventures. Twitter and Facebook can also be important resources. For example, join a Twitter chat, or follow a few employees at the company where you want to work. Engage in organic discussions unrelated to a job; this will allow them to get to know you as a person. A positive Twitter interaction might help you get recognized when you go in for an interview. Do use social media to showcase your personal brand. Just like products or companies, people have brands. What does your social media activity say about you? Are you an entrepreneur? A writer? Social media is the perfect and free way for you to build an audience, showcase your skills and promote your brand.